Our gates are made using our proprietary system using two old world joinery techniques combined with state of the art adhesives for a gate of unmatched strength and durability. Residential and commercial property owners in Saratoga want their landscape and exteriors to be as inviting and beautiful as possible. At Williams Gate Works we know the impact a unique custom wood gate can make when it comes to both curb appeal and functionality. From wooden side, garden and driveway gates to double gates, hardware and other accessories we provide superior products and workmanship so you enjoy lasting quality and beauty. Why settle for ordinary, inferior quality products that are just like everyone else’s? 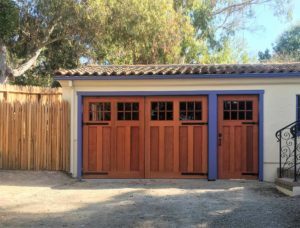 The majority of our custom wood gates for driveways, gardens, and side yard entrance are crafted of the highest quality lumber including Western Red Cedar, clear heart Redwood and Mahogany. Because of the types of wood we use and careful handcrafting of each piece (no mass production here) you can enjoy peace of mind knowing your wooden gate will never succumb to the splitting, rotting or warping often found in other types of gates. When you need an entrance way because of fencing or to make your driveway more private and secure, why settle for ordinary? Enhance your property with custom gates that are eye-catching, super durable and guaranteed to make you the envy of everyone in the neighborhood. We take pride in all we do, providing our customers with the highest quality and enduring beauty in custom driveway and garden gates, wooden double gates and more. From latches, hinges and locks to hardware packages and accessories, you can enjoy an exquisite entrance in nearly any style of your choosing from country and Craftsman to traditional, storybook, Asian and more. Let us create a custom wood gate for your particular style preference! For all of your residential and commercial needs we invite those in Saratoga, CA and surrounding areas including Palo Alto to contact Williams Gate Works today.